UAD-2 Satellite Thunderbolt will be available in Quad and Octo configurations. 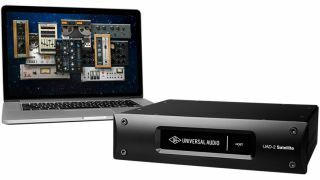 Universal Audio has unveiled Thunderbolt versions of its UAD-2 Satellite DSP system, which the company says will allow Mac users to "supercharge" their systems by giving them the option to "run larger mixes filled with rich, DSP-intensive plugins". Two models are available: Quad comes with four SHARC processors onboard, while Octo sports eight. In each case, the Thunderbolt connectivity is said to deliver "improved performance at higher sample rates, and reduced plug-in latency" in comparison to the FireWire UAD-2 Satellite. The new boxes can also be used alongside other UAD-2 and Apollo products for even more DSP power. Each Satellite Thunderbolt will be available with a choice of plugins: the Core package contains the Analog Classics Plus bundle; Custom adds a choice of any three UAD plugins when you register; and the OCTO Ultimate suite contains more than 79 UA-developed plugins. You can find out more on the Universal Audio website.